saw over the course of an hour on Palm Beach in Aruba. Radisson and Westin have set up shop on this beautiful stretch of beach. an hour of unadulterated people watching. So sit back, relax, and absorb how fact can be stranger than fiction when people watching on the beach. A man stood motionless in one foot of water… just staring at the beach crowd in front of him. This would not be a problem if it went on for a minute or two, but this guy sporting a bad moustache did his best “I have a staring problem” routine for the better part of 20 minutes. A German couple to my right conversed about something the husband had read on his E-reader. Sprechen sie Kindle? A couple walked from right to left along the beach. The guy’s head was adorned with a white beanie-type hat. Perhaps he’s practicing for the clergy. Off in the distance, a woman with an infectious laugh repeatedly cackled every three minutes or so. When you’re not people watching on Palm Beach, kite surfing is a more active diversion. A tattooed man lay prone with his mouth agape and right arm wrapped weirdly around his head. This is not the position I’d like paparazzi to find me in. A roughly 270-pound woman proudly strode by in a purple and black bikini. The Spandex elasticity was enduring the ultimate test. A 30-something version of Billy Crystal bounded in from the ocean. Billy must have heard “Chariots of Fire” playing in his head as he galloped in slow motion with a full bottle of Amstel Light held upright like a glass torch. About 20 yards from the shoreline, I spotted a woman lying on her back in the turquoise water. Peaking just above the water surface, all I could see were the tops of her red toes and prominent brown bikini top. From where I sat, the woman was headless. Should I be concerned? Where’s the crew from Baywatch when you need them? People watching pelicans watching people is another option from the beach. A pregnant woman pulled a yellow wife-beater tee shirt over her bikini-clad belly. I wondered what came first, the bikini or the baby on board? A bright-red parasail boat brought home a jet-ski that must have been incapacitated. A 50ish man wearing a lime green shirt walked the beach. I noticed he’s wearing wristwatches on both wrists. 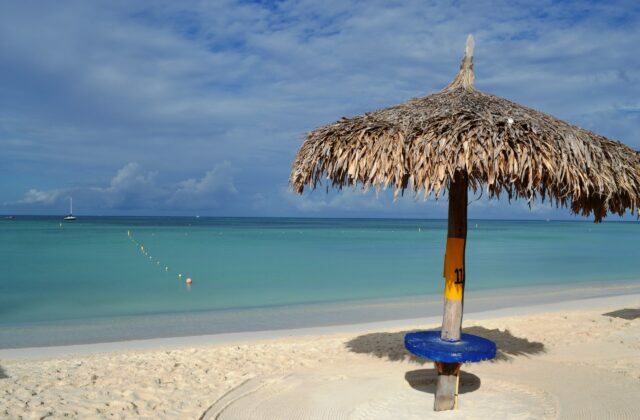 Aruba is so close to the Equator that perhaps the left wristwatch twirled counter-clockwise. A 20-year old scholar madly texted messages to someone on his i-phone. A fast-walking senior explained in high decibels to his wife that an acquaintance always “buys high and sells low.” He must have been talking about my broker. It’s amazing how many pirate ships you can spy if you’re looking for them. A woman studied her snorkeling gear in three feet of water. Her 135-pound husband stood guard as she boldly thrust her face in the water. A woman wearing a brown wrap walks by with her head tilted back and her feet positioned well in front of her body. I’m betting big money this woman wins the limbo contest held somewhere in Aruba tonight. Right in front of me, a woman wearing a red and blue thong bent over to pick up her sandals. This impressive visual was a reminder that I needed to get up at the crack of dawn tomorrow. A Dad took his kindergarten age daughter out in shallow water to look for shells.Dad held a plastic cup in his hand to gather the bounty. If you’ve never tried it, settle under a palapa and chronicle what you see on the beach. Out of nowhere, dual wristwatch man walked by from the other direction. At least five minutes had expired since his last watch-worthy moment. An albino woman walked by – amazingly without a hint of sunburn. About 40-feet from shore, a flying fish skipped along the water. Just below the setting sun, a pirate boat hovered above the glistening Caribbean Sea. It’s hard to tell if Johnny Depp is at the helm. At this point, I was half tempted to search for dual wristwatch man and see if an hour had passed. I started to feel guilty about how I was spending my time. Plus, I wondered if anyone was starting his or her own beach chronicle while watching me scribble haphazardly in my notebook.